February 2017 – Steampunk – Shrunk! Now this is the technology I feel most comfortable with – the glorious make-do-and-mend in which quite humdrum objects are cunningly combined and formed into wondrous contrivances (in time-honoured steampunk style, I feel). After much padding, cutting and stitching, she cuts a fine figure, I’m sure you’ll agree. As for contrivance, well don’t let her know that I’ve shared this information with you – heaven knows what she’d say – but the stick of her parasol was fashioned from a cotton bud stick, covered in copper tape (sold to gardeners as a slug repellent). The shade itself was moulded over the cap of a roll-on deodorant – lace and garden wire struts stiffened with PVA glue, before being covered and trimmed with fabric and lace. A few beads were added top and bottom, and her accessory was complete. 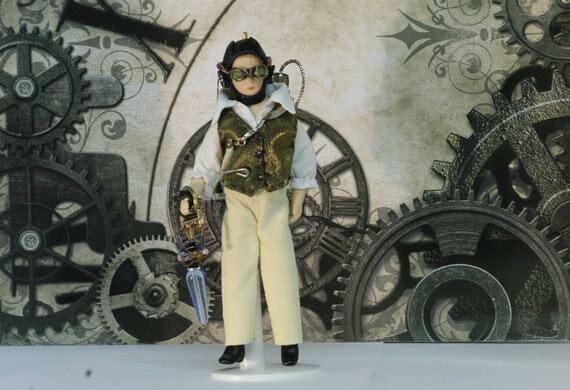 I am far less comfortable with the technology involved in social media, and it was not without considerable difficulty that I endeavoured to produce a Facebook page to showcase the items featured in Steampunk – Shrunk. 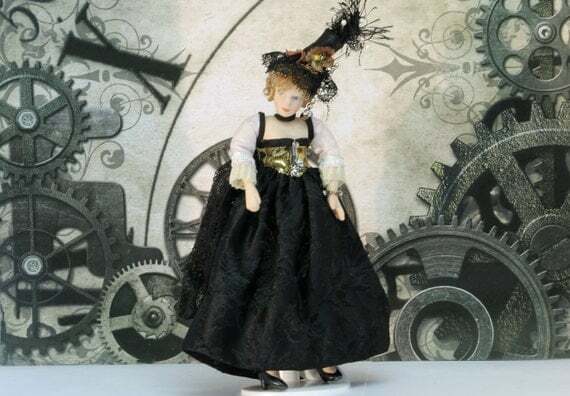 If I have achieved my goal, followers of that page should be alerted to the publication of this post … and by visiting this link: https://www.facebook.com/steampunkle/ you should be able to visit, like and follow that page. I trust that you will make that journey smoothly, and not become irretrievably lost in some etheric time warp. “The Kraken, Mr Dalrymple? Are you teasing me a little?” Grace asked. She so wanted to believe his story, but was determined not to be taken for a fool. “So how did you survive this fearful attack?” she enquired, glancing at the mechanism which controlled his beaten copper arm. A shadow crossed Jack’s face as he recalled the event and he gave an involuntary shudder. “You poor man!” Grace cried, staring deep into his eyes. Jack flushed slightly at the attentions heaped upon him by the beautiful redhead. Grace rose to her feet. “It’s been delightful to meet you, Mr Dalrymple,” she smiled. “This way, Miss,” said the assistant, and Grace was ushered through into Oscar Kopp’s laboratory.